“It all comes down to the ideas and the people,” said Remo Giuffré, founder and licensee of TEDxSydney. “That is the essence of TED.” Gazing out at the crowd, Giuffré recalled memories of TEDx past, held in the grand space of the Sydney Opera House, where Pitch Night occurred in the elegant Utzon Room overlooking the Sydney Harbour. Filling out the full length of the Utzon Room, TEDxSydney pitch presenters shared their own visions of how to harness technology, change education, connect people, and improve the world through ideas or artificial intelligence. The flow of empathy was palpable, with no one on their devices or talking to a neighbour during any of the pitches. The sponsor Samsung Galaxy Note9 had generously gifted every chair with a blue paper notebook and a yellow pen. It was an old-school party gift of sorts, appropriate to the venue and thoughtful. People could listen with full attention rather than taking notes on phones. They could jot down names of speakers they wanted to vote for in the “People’s Choice Award.” Or they could record ideas worth remembering and take home inspiring concepts. I noticed that even Samsung large colour poster was shaped as an X, reflecting back to the room that people here gathered at the intersection of presenting and listening, meeting new people and joining a community that thought and felt deeply. As head of ceremonies, Curator Fenella Kernebone encouraged the audience to respond emotionally. She kicked off the evening with a warm invitation for listeners to embrace and celebrate the speakers. 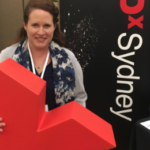 “In true TEDxSydney flavour, you make them feel the love,” she told listeners. There was a distinct lack of hierarchy throughout the event. The colourful lanyards did not identify the speakers so that people were gently made to ask questions, to open conversations with genuine curiosity, to get to know others on equal footing. Pitch Night seemed as much about great proposals as it was about cultivating love in the community across speakers and audience, amongst listeners, curators, TEDx staff, and supporters. It truly all came down to “the ideas and the people” – in a taste of what is sure to come with TEDxSydney 2019 and the TEDxSydney Hub.